American rabbi; born at Wollstein, Germany, May 30, 1865. He attended successively the gymnasium of Hirschberg (Silesia), the public schools of Philadelphia, the University of Cincinnati (B.A. 1888), Hebrew Union College (rabbinical diploma, 1889), and Johns Hopkins University (Ph.D. 1900). Rosenau was rabbi of Temple Israel, Omaha, Neb., from 1889 to 1892, when he became rabbi of Congregation Oheb Shalom, Baltimore, Md. In 1896 and 1897 he was second vice-president of the Central Conference of American Rabbis; and since 1903 he has been corresponding secretary of that body. 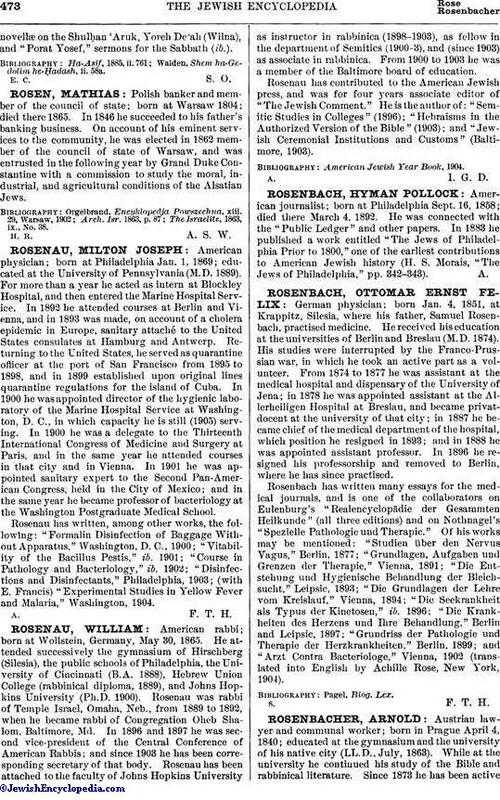 Rosenau has been attached to the faculty of Johns Hopkins University as instructor in rabbinica (1898-1903), as fellow in the department of Semitics (1900-3), and (since 1903) as associate in rabbinica. From 1900 to 1903 he was a member of the Baltimore board of education. Rosenau has contributed to the American Jewish press, and was for four years associate editor of "The Jewish Comment." He is the author of: "Semitic Studies in Colleges" (1896); "Hebraisms in the Authorized Version of the Bible" (1903); and "Jewish Ceremonial Institutions and Customs" (Baltimore, 1903).